A second marriage is different. It starts with a second wedding. This wedding is also different. First of all, you are an old hat. Second of all, much of the weight is (hopefully) lifted. Author, "Living Room" and "The First Hurt"
This was the case for me. With my first marriage, I was hoping to begin my life. Now, years later, with an amazing five-year-old daughter, feeling inspired in my writing and teaching, and so in love with my new husband, I feel like I have the life I have always been waiting for. Marriage now is not a hope, but a continuation. I know what the future will look like, and I couldn't be more thrilled. To begin again is not easy, and a second marriage with a child calls for a very different kind of wedding. Not only is your new husband marrying you, he is creating a new family, committing to your child as well. Although my five-year-old daughter was thrilled that I was remarrying, explaining this to her friends ended up being almost as difficult as explaining who my boyfriend was to them before we were engaged. Although my daughter was clear on this, her friends had many questions. How could she have both a dad and stepdad? Why was I remarrying? And most importantly, would we kiss at the wedding (ew!)? My fiancee and I decided to incorporate my daughter into the ceremony and planning as much as we could. Of course she would be the flower girl, but that didn't feel special enough. We did not want her to feel left out, or fear that now that we were marrying, things would change. We assured her repeatedly (even without her asking) that everything would stay the same. We would live in the same apartment, she would go to the same school, life would go on just as it had. The only difference would be that we would be married, and she would have a stepdad. - We included my daughter in all the planning: She picked her flower girl dress, participated in my hair and make-up trials, and chose the colors of her flower petals. - Many of our friends are the parents of her friends, so my daughter's friends were invited to celebrate with us. They had all been looking forward to the wedding, showed up in adorable party dresses, ran around, making the party my daughter's as well. - We made goody bags for each child with things that symbolized the wedding (and some things to keep them occupied). You can get small toys at dollar stores and personalized gifts (in bulk) on Etsy. We got lip balm, rings, crayons for the coloring book (see below), and stickers. - After she threw the flower petals, my daughter stood with my (future) husband and the officiant for the entire ceremony. She was mentioned repeatedly in his speech. 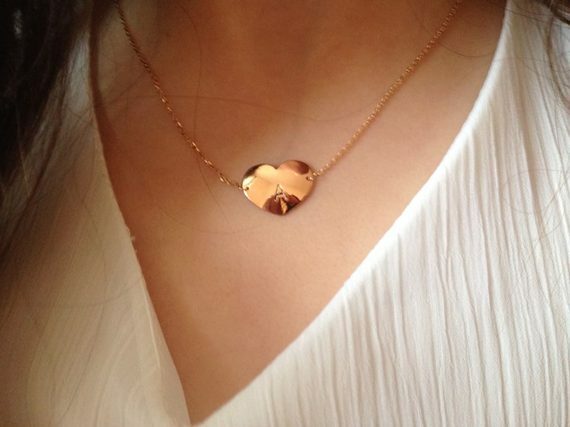 - As both my husband and I were both getting rose gold rings, we bought my daughter a rose gold necklace that she helped to pick out, which we then used in the ceremony. Before we placed the rings on each other, the officiant spoke about our love for my daughter, and then we both clasped the necklace around her. - Since we are both writers, it seemed only appropriate that our party favors were books! We made coloring books for each guest (but directed towards the children). I put our photographs through a program that converts photographs into drawings. A good one is Dumpr. I then outlined the drawing with dark lines so that the pictures were more clear, and xeroxed them. I put a cover made of construction paper, tied them with ribbons, and viola! The book was called The Story of Us: A Brief History and told the narrative of my daughter and I meeting my husband, becoming part of each others' lives, giving details and anecdotes, all in "child-speak." The children used their crayons to color them after the ceremony at a table we set up for them. Combining families takes thoughtfulness, patience and creativity. If an idea resonates with your child, try to incorporate it into your ceremony in a way that is accessible to your friends and family. It will be a great day, and even more meaningful if your child is a part of the process!